Although squirrels can be a very cute and important part of a natural ecosystem, the same cannot be said when they turn your house into their home. These rodents are known for causing havoc among electrical wiring, woodwork and gardens if not controlled properly, and can be the cause of dangerous diseases finding their way into your house. Because of this, we bring you some of the most notorious reasons to use a squirrel trap to catch them. Take a look at your patio, garden and backyard and search for signs of damage like mangled plants, ruined barks and damaged fruit trees. One of the most telling signs of rodents inside the house are chewed off and broken wiring. Since attics are one of the most likely places for squirrels to hide in, make sure to look there first for these signs. As with every type of animal that might be living in your house, look for feces and fur in the corners of the rooms you think they might be living in. listen up for the telltale sound of small paws racing along your walls, over your ceiling and even inside your chimney. This could also mean that baby squirrels have been born into your home, which is another good reason to use a squirrel trap. Each small squirrel that finds its way into your house can carry an amazing amount of ticks and fleas that could easily jump into your carpeting, your drapery and your pets’ fur, filling the space with the potential of Lyme disease. Squirrels dig around the garbage for things to eat, and if you have outdoors water storage that is not secure, they are likely to drink from it as well, contaminating the water with dangerous bacteria. The same happens if you have fruit trees or orchards in your yard. 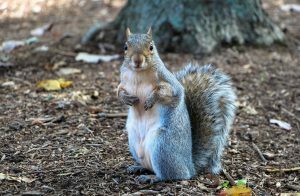 Some of the most common diseases you can get from being in contact with squirrels are rabies, Salmonellosis, and Tularemia, which can be infected through the ingestion of feces and by getting bitten by a carrier bug like fleas or ticks. Easily, the best and safest way to get rid of your squirrel problem is by using a squirrel trap. These are the most humane contraptions to use to make sure you securely trap these little animals without harming them and without coming into contact with them, avoiding touching their fur or getting bitten, which may lead to risky infections. The best squirrel traps are those made with strong and resistant materials that can last you several seasons, seeing as if you don’t keep up a consistent repelling plan, you might not be seeing the last of these rodents. 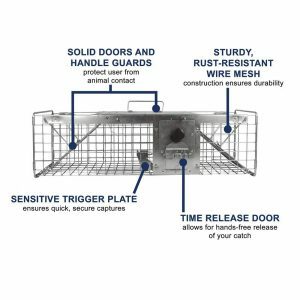 As for the options you have regarding the types of squirrel traps, you can choose between a one-door or a two-door trap. 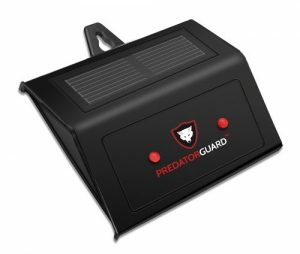 Each one has its own set of pros, with the first one allowing you to set the bait farther into the trap to make sure the squirrel gets securely inside, while the latter gives you double the chance of catching the chipmunk, and you can use it as a one-door trap as well. 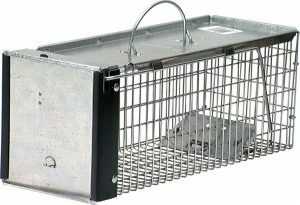 When using a trap, you get the opportunity to get rid of the squirrel by setting it free miles away from your home and into a more suited environment, but also keep in mind the risks of coming into such close contact with a wild creature that could possibly be infested with diseases, so wear gloves and a mask while dealing with the trapped animal for maximum safety. Once your home is squirrel free, thoroughly clean any droppings left behind, check that no younglings’ nests are left, and close any entry holes made by the animals. Also, research and follow a regular plan that involves using chemical repellents to prevent having to use the squirrel trap at all. How to Get Rid of Coyotes in my Backyard? Best Raccoon Trap Bait To Instantly Attract Raccoons! Are Dog Proof Traps Cat Proof?